This project emerged within the Associationism Contest organized by Deusto Business Alumni in collaboration with Bizkaia:talent-Provincial Council of Bizkaia in which 15 students from Deusto Business School have taken part. The presentation of Connectia will take place next Monday, November 3, at 18:00 in the Faculty Club. The chosen subject has been the deep change and the social innovation brought about by the industrial conversion of Bilbao in the last fifteen years, from the grey Bilbao to the modern and avant-garde Bilbao of today. The event will be attended by first-rate experts on the subject, such as Ibon Areso, the Mayor of Bilbao; Ana Andueza, Partner of the Public Sector Consultancy of Deloitte; and Cesar Azcarate, IDOM Architect for the new San Mames, who will tackle the subject of the industrial conversion of Bilbao from various approaches. During the event, the speakers will first deliver a talk and then there will be time for questions from all the attendants. The winners of this first edition of the University Associationism Contest were the Association Connectia and the Association Lagunarte, which competed with 98 students from the three degrees offered by the Faculty (BMA+Management Development Programme, BMA+Industrial Technology Engineering and BMA+Law), divided into eleven groups, who submitted 12 proposals to create associations related to Management and Economy, Cooperation and Culture. 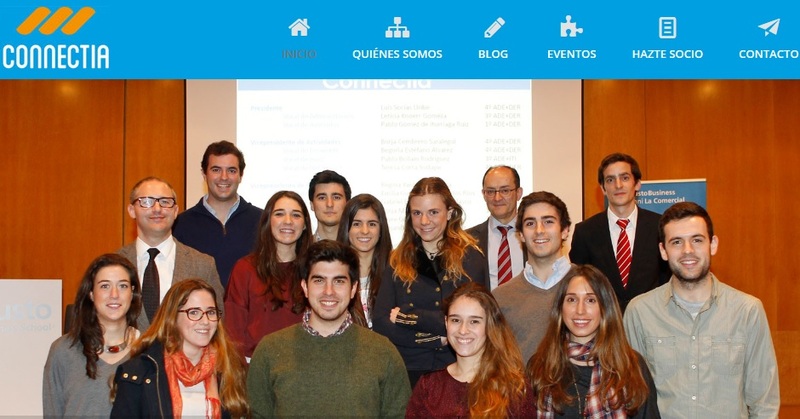 The founding group and current members of the Board of Directors of Connectia are 15 students from various courses and degrees, all of them from Deusto Business School, thus comprising the whole faculty. The Association CONNECTIA promotes innovation, entrepreneurship, leadership, ethics, internationalization and commitment to society, values which are nowadays essential to build a good future. Inno+: activities and workshops with a common feature: innovation. Netimpact: carry the dBs mark all over the world as members of the international association of students ‘net impact’.